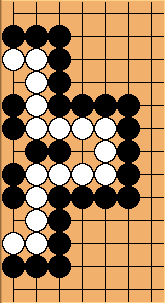 In a seki where White and Black have a different number of surrounded points, the score varies over rulesets. It does not depend on the choice of territory or area scoring. What matters is whether eyes and false eyes in seki are considered territory. In AGA, Chinese, French, and New Zealand rules, they count towards a player's score. Under Japanese and Korean rules, they are not worth points to either player. Whilst territory and area scoring usually differ by only one or zero moku, treatment of surrounded points in seki can result in a significantly greater difference. Neither scores anything for Black. Robert Pauli: Decide yourself who's right, but isn't it quite convincing only to score territory that can be safely filled? In this seki, White encloses six points, but Black just one. is neutral (shared) under all rules. There shall be no komi nor prisoners. Djaian : Huh?, I just have a question, and I am not sure, but isn't there "the pass stone" rule in japanese rules? Suppose it's black turn, he will pass, and thus give a stone to his opponent. Now white fills one of the circle dot (a false eye, not the real one ! ). Black passes again, and give another stone... And so on. So the final score should be the same whatever the rules. Am I right? I think that is the reason for the pass stone rule. Of course, in chinese rules, no need of a "pass stone", since scoring is the same if the circle dots have white stones or not. Can someone tell me if my reasoning is correct? Herman Hiddema: The pass stone rule is specific to AGA rules, it is not used in Japan, Korea or Europe. Using pass stones basically means that under AGA rules, scoring is area scoring, and the pass stones allow you to count in the way of territory scoring. The reasoning you give about how the score works out with pass stones is correct. Djaian: Thank you for your answer. So this means there is actually a difference if we count according to Japanese rules or Chinese. Note that the asymmetry examined here concerns seki territory only. Sometimes, another asymmetry is interesting, which is the area? tally of the seki (territory + stones). About that, see 10000 Year Ko and seki collapse. Bill: I think that odd eyed seki is an odd name for the kind of position talked about on this page, since the number of eyes can be even or odd. Can anybody come up with a better page title? Bbbbbbbbba? : In my opinion the "odd" doesn't mean "odd numbers" (like 1, 3, 5...). Instead it means "uneven, unpaired". As is stated at the top of the page, in this kind of position the numbers of white eyes and black eyes are different. Doesn't this make sense? Robert Pauli: Let me nevertheless add the alias unbalanced seki. Robert Jasiek: The correct term is: asymmetric seki. Robert Pauli: Says who? Karl's first example looks pretty symmetrical to me. Wouldn't fit that one, right? My term does. Robert Jasiek: Say the experts having studied such sekis since the 1990s. Note that an odd seki is a seki with an odd number of not scoring liberties. What you call an unbalanced seki has groups with a balance of liberties; therefore it is a seki indeed. Hence both odd seki and unbalanced seki are very bad suggestions as names for the term asymmetric seki. What is being asymmetric is the groups' kinds and places of adjacency of liberties. Robert Pauli: Are we talking about the same page, Robert? The title on the top reads odd-eyed seki (my hyphen, BTW), not odd seki. And the sekis in question are those, where one side has enclosed more than the other (again, read the top). Therefore unbalanced seems perfectly appropriate to me. Territorial unbalanced if you want, but that's understood. Territorial asymmetric instead could suggest that the shapes of the territories matter, but they don't. You should keep three things apart: name, definition, and intention. As far I see, my name fits to the definition (not mine, BTW). The old name fits less well because as my simple example at the top or Karl's second example shows, it can be two eyes versus none, and two isn't odd. Black has one extra move here, as we all know. That's just like filling an extra (or odd?) eye. Stone scoring as well as area scoring grant you that extra point, Japanese rules don't. If that's the case, then asymmetric neither captures the intention (rules don't matter after Black's upper fill), provided we ignore Ing's minutely divided common space (Essays on the Rules of Wei-Ch'i, 1981). Robert Jasiek: Territorially unbalanced is not good, either, because some rules assign no territory. Look for a term to express empty strings adjacent to one versus two colours. I agree that asymmetric is not perfect linguistically but it is the current term. 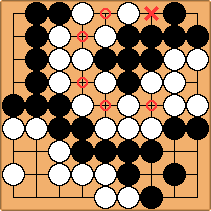 This seki is unfair-spaced (White enclosed three points, Black only two), but not unfair-eyed (each side counts one eye). Despite its unfairness, it is not rule-relevant (White always gains two points). 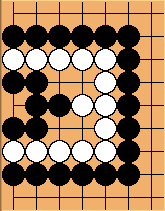 This seki is unfair-eyed (Black counts two eyes, White only one), but not unfair-spaced (each side encloses two points). Despite its unfairness, it is not rule-relevant (White always gains one point). Robert Jasiek: Good question and one I might be able to answer. Unfortunately, I lack the necessary time whilst being busy writing several go books. Meanwhile, look into Thomas Wolf's seki paper and the greedy ancient rules in Mathematical Go Endgames to get an idea of how to approach a definition. Robert Pauli: There's neither any symm in Wolf's paper, Robert, but thanks anyway. Since I guess that the one-sided-dame seki also should qualify as asymmetric, this term is more general and not appropriate here. Restricting eyes to be minimal removes the discrepancy between name (counting eyes) and definition (counting space), but unfortunately does not rescue the claim (that all unfair-eyed sekis are rule-relevant), as this example shows (claws not shorter to avoid two for one). After both add a stone, there neither is an eye nor a pass stone, rules could disagree on. Another example, with a less controversial eye. or both. Each ruleset disagrees to the other. The third ruleset, the often forgotten stone scoring, always disagrees (as me :-). ||   = 28 + 10 points + 4 shared   | . . .